Why will the Wine Down Box change your life? Imagine you are walking into your place after a long day. You are exhausted but still wound up from a frantic day. Has your thoughtful partner paired a nice board of cheeses and meats with the perfect glass of wine? We didn't think so! Then you remember. My Wine Down box was just delivered. You retrieve it from the place you carefully stored it. The perfect pairing was waiting for you all along. Sit back, relax, and enjoy! The Wine Down Box is a gourmet wine and cheese experience delivered right to your front door. More than your average wine of the month club, this is a food and wine experience. Expertly selected for maximum enjoyment. Here is a sample of a recent Wine Down Box pairing. 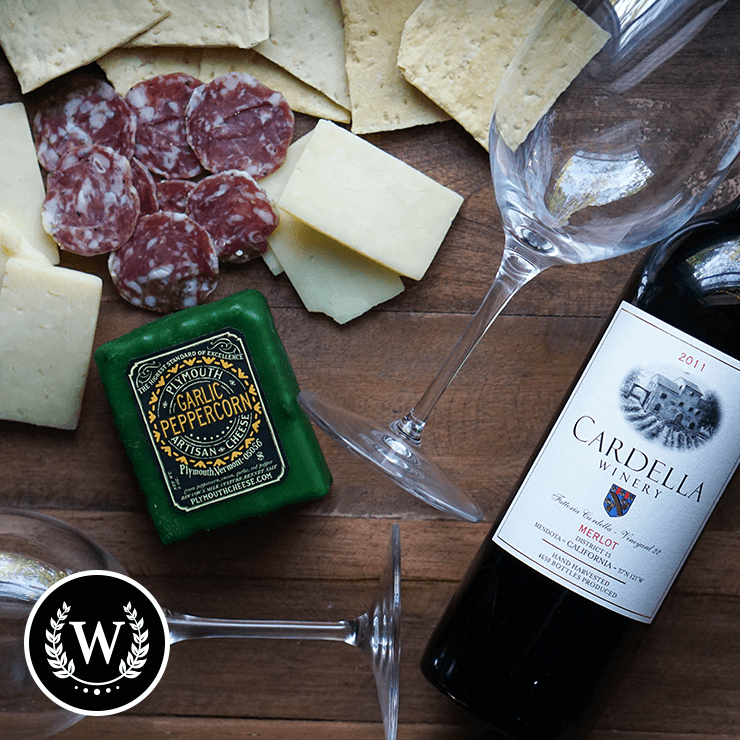 This 2011 Merlot from Cardella Winery is a classical beauty—no wonder it’s received a number of well-deserved awards. Firm and silky, it opens with herbal notes and aromas of light currant, which are swiftly followed by flavorful red fruit and fresh herb on the palate. The tannins are delicate, with subtle hints of toasted oak throughout. We’ve complemented this wine with a Peppercorn Garlic cheddar from Plymouth Artisan Cheese. Inspired by the flair and finesse of the French kitchen, this cheese boasts a vivacious character and creamy texture, with savory elements of onion, garlic, red peppers and green peppercorns throughout. These flavors balance the notes of herb and currant in the wine, allowing them to work together without one overpowering the other. The handcrafted Barolo salami from Alle-Pia Fine Cured Meats features Barolo wine from Italy along with a selection of fresh spices. Known in Italy as Salame al Barolo, this traditional artisan salami is a delicacy that comes from Piemonte in Northern Italy—the birthplace of Barolo wine as well as of the Alle-Pia family. With its array of spices and robust flavor, this salami adds an additional layer of complexity to the pairing and brings a welcome edge to the marbled creaminess of the cheese, while its richness further softens the delicate tannins in the wine. Can I afford a Wine Down Box subscription? We think you can. If you are already buying wine and cheese and meats, you may even save by allowing the Wine Down people to do it for you. Here is a link to the prices. You can enjoy this service for about $65/mnth if you sign up for six months. If you commit to a longer term, your cost per wine and cheese box goes down. And it is a little higher if you opt for the month to month plan. Shipping is included in the price. This is huge when it comes to wine clubs! Will they treat me right? The folks at Wine Down Box are eager to please. They encourage you to contact them if you are unhappy with any aspect of your wine club shipment. From the research we've done, most subscribers to the Wine Down Box service are happy with the service. 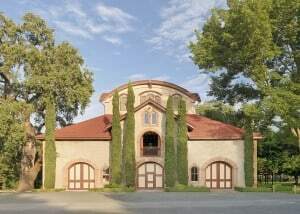 They are also pleased with the quality of the food and wine they receive each month. Will I enjoy the wine? Wine Down Box selects wines from California that they feel pair nicely with their selection of cheese and meat. The price points for the wine appear to be around $20. You can find a wide range of quality wines at the price point. This is not a club for wine aficionados. The wines are part of an overall experience. 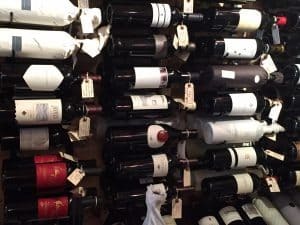 Check out our list of the 20 Best Wine Clubs if you want to find clubs that are focused on high-end wines.  How do I know if this is the right wine and cheese subscription for me? This is a unique wine subscription service. You can't find many options that include wine, cheese, and charcuterie in a monthly delivery format. If you want the convenience of wine and an appetizer, this is the way to go.